The other day I received in my mailbox a very interesting leaflet with information about "Lifeline". An organisation that exists to help women who are considering abortion or who have had an abortion. I was so happy to read about their work. I have been travelling in southern part of Sweden and had 5 evenings in different Pentecostal churches with a pastor namned Tommy Dahlman. Joakim Holgersson, my pianist, was also with me and accompanied. Tommy interviewed me these evenings about dignity, quality of life and human rights. These are important issues in the community and in the world we live in. 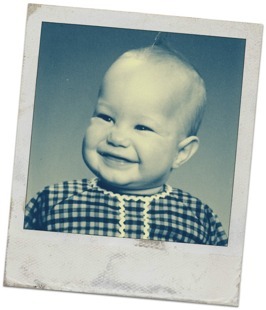 I was born in 1968, in my own opinion just in the right time, because I could reap what many disabled people had fought and worked for many years in terms of rights and obligations and integration. Thanks to it I could go to a regular school, study at the university, get a driving license, get an apartment whereever I want, start my own company and earn my own living just like everyone else. Some may think that this is obvious in the society we live in today, but much of the world does not look like Sweden. If I had been born in Japan for example, I had probably lived in an institution and disconnected from society. In no way miserably but without any of the things mentioned above. Japan is a country with a hierarchy where one is treated for what one can do and who you are. Shinto and Buddhism have in many ways shaped the society after that the life you've been given is what you deserve. So I must have lived a bad life in my past life since I was born with such a severe disability. In Thailand, I had probably been abandoned by my mother in the hospital or at a bus or sidewalk. Hinduism teaches that when you have a child with a handicap, however small it may be, it means that you have bad karma. If you choose to care for your child it places the whole family at the bottom of the social scale. It is e.g. difficult for siblings to marry, for no one wants to marry into a family with bad karma. I support through my 'Lena Maria & Friends Foundation' an orphanage in Bangkok with about 500 children. The abandoned disabled children who are lucky enough to be found in time grow up here. A few years ago I was in Tanzania, together with Mr. Göran Skytte, one of Sweden's most experienced journalists. We visited the university SEKUCo up in the mountains that is educating special teachers, and made a film where I also had a conversation with the principal Ms. Anneth Munga. She told me that if I had been born in Tanzania, I had probably been living among the cattle and been tied there. I had been a big shame for the family. The examples above are not a hundred years ago, but now! Therefore, I'm so happy and grateful that I get to be born in Sweden - a Christian country. Here we have a law that is based on the Christian fundamental values that all people have the same value and therefore should have the same rights and obligations. Of course, there is much that needs to get better, but in comparison I live in a fantastic country. I am also born before prenatal diagnostics time. Had they been able to see that I had no arms and only had one and a half legs when I was a fetus they had most likely recommended abortion, I think. For a person with no arms and only one leg can not have a life of greater value - or can one? Or how do we look at other types of disability? Down's syndrome, for example, Many think we should "clear away" those tiny life. But who can stand in judgment over whose life is worth sufficiently much? Personally, I think that when the little sperm wins the race to the egg and fertilize it - life starts. Looking at it that way, we are all winners from the start. No matter how we look or how much we can do or not do in this world. Nature is so smart itself that it sorts out the life that is too weak. Often to the great sorrow of the pregnant woman who miscarries. 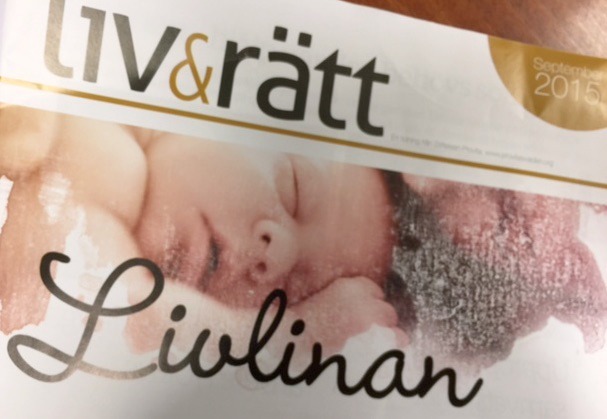 Therefore I was so happy when I saw the September paper "liv&rätt" (life&right) and the work that Lifeline does for both men and women who are considering abortion and need someone to talk to. Even those women who had an abortion and the need to converse can consult. The abortion issue is great and really not easy. When talking about such things we must have great respect for each individual. Everyone has their story to tell and there are no easy answers. At the same time I feel that I want to be a voice for the unborn child. I think we should talk more about how we can shape a society that can accommodate children where the mother or father can't, don't want or are able to take care of their child themselves. So many couples who long for their own children but can not get in a natur way. A society which also advocates that the child is born and where abortion is the last resort. Every life that arise, I think, is unique and irreplaceable. Every person has something to give to their environment. If we allow everyone to take part, I believe that our society becomes stronger, richer and full of colors.